This was the movie that changed a lot of things for both the movie industry & for me. This movie has taken inspiration from lots of things like science fiction movies, cult, religion, philosophical books, anime. It's more like a mixture of everything. This movie is known for many things like the Background Score, Cinematography, Stunt Choreography, Graphic animation etc. 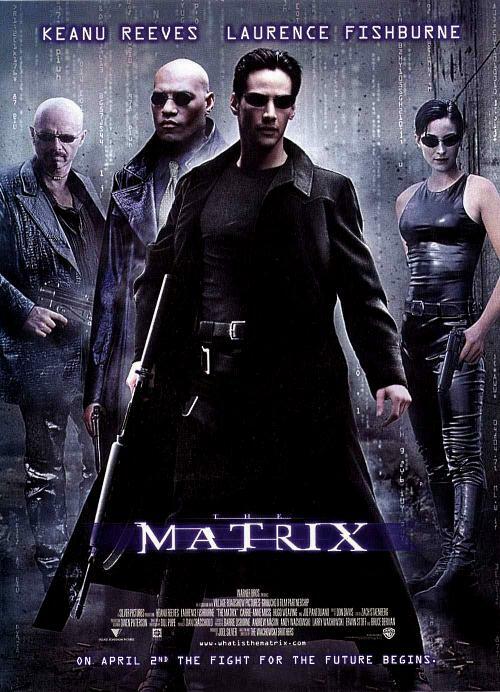 Its after watching this movie I became a great fan of Keanu Reeves. I would rate it as one of the best science fiction movie ever to be made. It's a must watch for all science fiction lovers and for others. Here is the famous dialogue from the movie where Morpheus explains the reality to Neo. Morpheus: This is the construct. It's our loading program. We can load anything from clothing, to equipment, weapons, training simulations, anything we need. Neo: Right now we're inside a computer program? Morpheus: Is it really so hard to believe? Your clothes are different. The plugs in your arms and head are gone. Your hair is changed. Your appearance now is what we call residual self image. It is the mental projection of your digital self. Morpheus: What is real. How do you define real? If you’re talking about what you can feel, what you can smell, what you can taste and see, then real is simply electrical signals interpreted by your brain. This is the world that you know. The world as it was at the end of the twentieth century. It exists now only as part of a neural-interactive simulation that we call the Matrix. You've been living in a dream world, Neo. This is the world as it exists today.... Welcome to the Desert of the Real. We have only bits and pieces of information but what we know for certain is that at some point in the early twenty-first century all of mankind was united in celebration. We marveled at our own magnificence as we gave birth to AI. Morpheus: A singular consciousness that spawned an entire race of machines. We don't know who struck first, us or them. But we know that it was us that scorched the sky. At the time they were dependent on solar power and it was believed that they would be unable to survive without an energy source as abundant as the sun. Throughout human history, we have been dependent on machines to survive. Fate it seems is not without a sense of irony. The human body generates more bio-electricity than a 120-volt battery and over 25,000 BTU's of body heat. Combined with a form of fusion the machines have found all the energy they would ever need. There are fields, endless fields, where human beings are no longer born, we are grown. For the longest time I wouldn't believe it, and then I saw the fields with my own eyes. Watch them liquefy the dead so they could be fed intravenously to the living. And standing there, facing the pure horrifying precision, I came to realize the obviousness of the truth. What is the Matrix? Control. The Matrix is a computer generated dream world built to keep us under control in order to change a human being into this. Neo: No. I don't believe it. It's not possible.